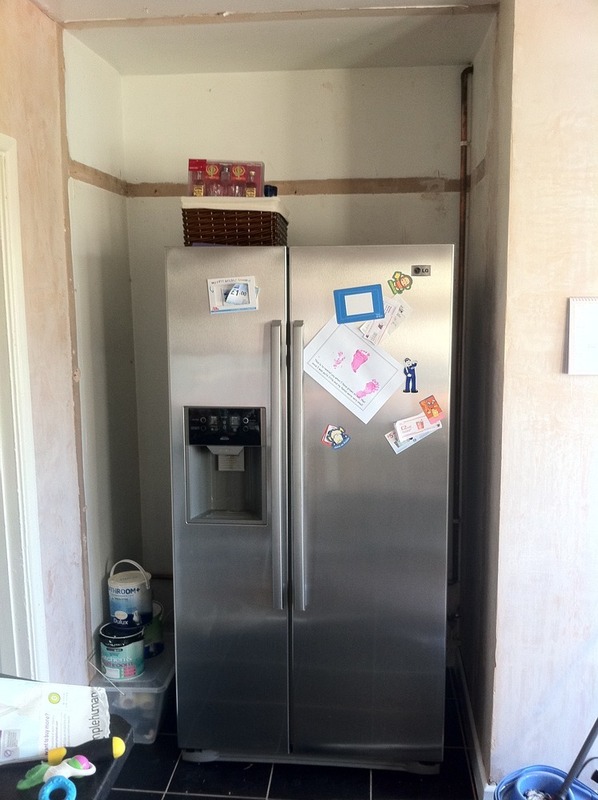 I removed an old cupboard unit to make space for one of those big fridge/freezers, I love the fridge but miss the cupboard space, I would like to have some cupboards built around the fridge. For a professional with all of the right tools, this is a very simple job, i've made it as descriptive as possible, but this does not mean it is complex, so no sucking through your teeth..please. 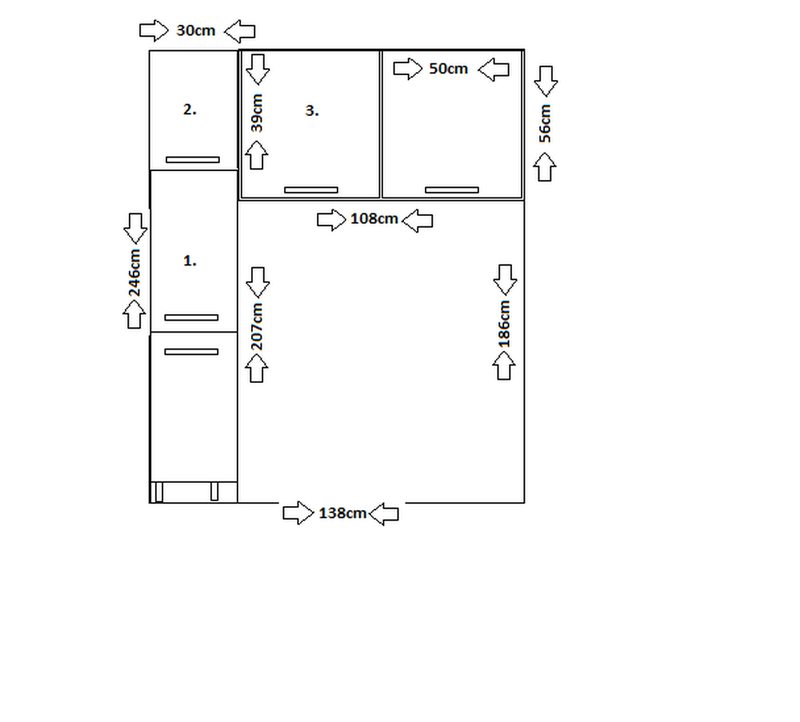 I drew a picture which should show the measurements of the space and the cupboards required. To easily fit into the kitchen, I would suggest using conti board or similar? A Tall Larder Cupboard, to take a mechanism with wire baskets. 300mm wide, 2070mm high of which 150mm are legs and the cupboard is 1920mm high, the larder which match the kitchen are 297mm x 956mm each, these will be fixed to the unit and each other. A cupboard to fill the remaining space to the ceiling, a matching door to be cut to height,maybe fitted with a stay open hinge, dimensions are 300mm wide x 390mm high. 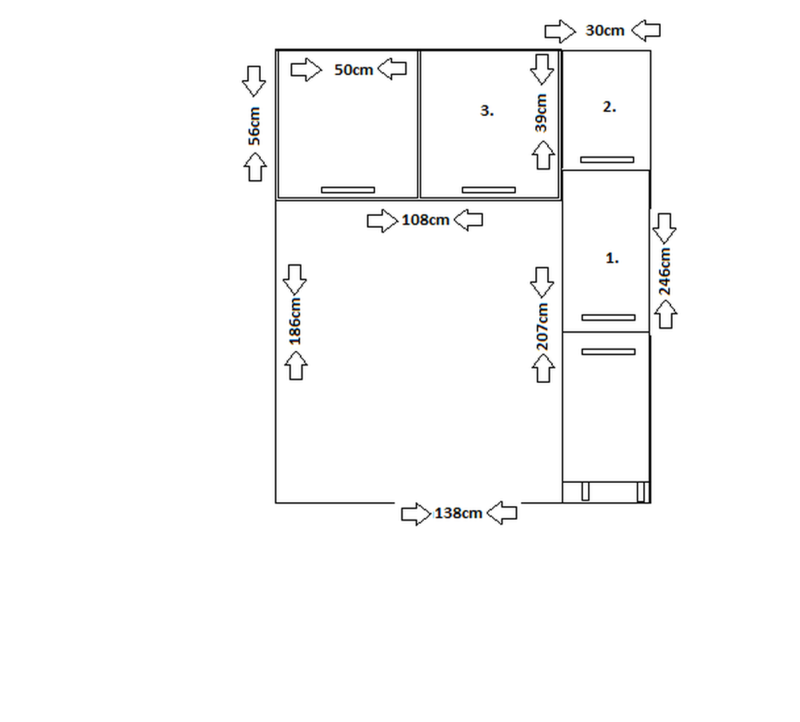 The remaining space is 108cm wide, so I would like cupboard making this wide with a height of 56cm, 2 matching doors to be fitted which are 500mm wide x 557mm high each. Added 1st September, 2011 : The matching doors are all from the B&Q Walnut Style Modern range, and I already have all of these. Added 3rd September, 2011 : I also have the larder mechanism, which is a soft close system, its height adjustable from 1750mm to 2050mm and requires a depth somewhere around 490mm. Added 11th September, 2011 : Because of the fridge/freezer opening, it might be better to flip the larder from the left to the right, so I have amended the drawing, nothing else changes dimension wise. Feedback for DNA Project Solutions Ltd.
My preference was for the job to be done on a weekend, (rather than in the week), so I booked Darren a couple of weeks ago, he said he'd be with me yesterday at 8:30am, true to his word, he arrived on time, and to be honest, he didn't stop all day, well only when I stopped him to discuss how certain elements were coming together. We had discussed that these new units should 'fit' into the existing kitchen, and that my drawing was my best effort, but by no means 100% accurate, and that pelmet, plinth, handles and iron on edging form the required finish. The instructions for the pull out larder unit were a bit muddled to say the least, but Darren negotiated them without any bother. I am extremely happy with the finish, and with Darren, I would happily recommend him, on here, and to my family and friends.